Whether you’re nursing a hangover courtesy of last night’s bar crawl or are just looking for somewhere to relax, there are plenty of places in Budapest you can head to for some down time. Read on to discover four of the best places to chill out in Budapest. 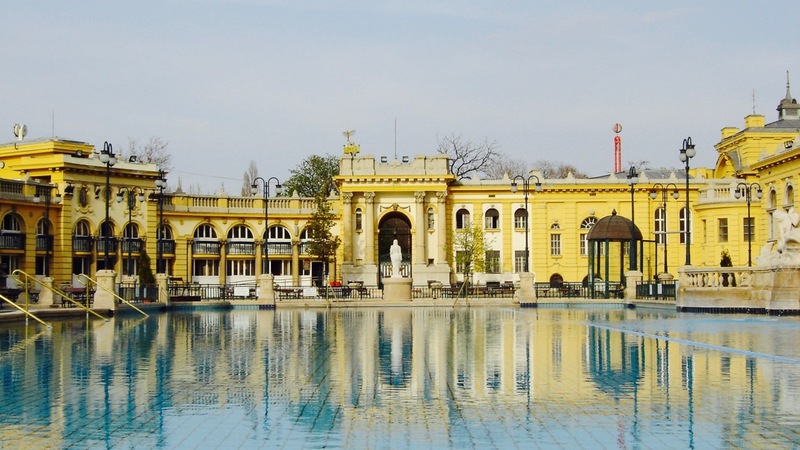 The Szechenyi Bath is one of the most popular thermal baths in the city, and just a short ride on the M1 Metro in the North-East of the city. The Szechinyi bath is the largest medicinal bath in Europe, supplied with water from two thermal springs, pumping in water at a toasty 74 °C. Not only can you lounge around in a variety of indoor and outdoor thermal baths, you can also get a range of different Swedish style massages to really start relaxing. There’s also a large swimming pool giving you a chance to do some lengths, or a sauna if you’d rather sweat out last night’s double vodka RedBulls. If you’re not in the mood for swimming, then why not go for a cruise on the river? Budapest is actually made up of two cities, Buda and Pest, which are bisected by the Danube. As a result, some of the best views can be had from the river itself. On our last trip to the city, we picked up cheap boat tickets from a dock near the Elisabeth Bridge, giving us unlimited travel up and down the river for the day. Taking the boat to Margaret Island, we got great views of some of the main tourist attractions in the city, along with an audio guide and a well stocked bar. 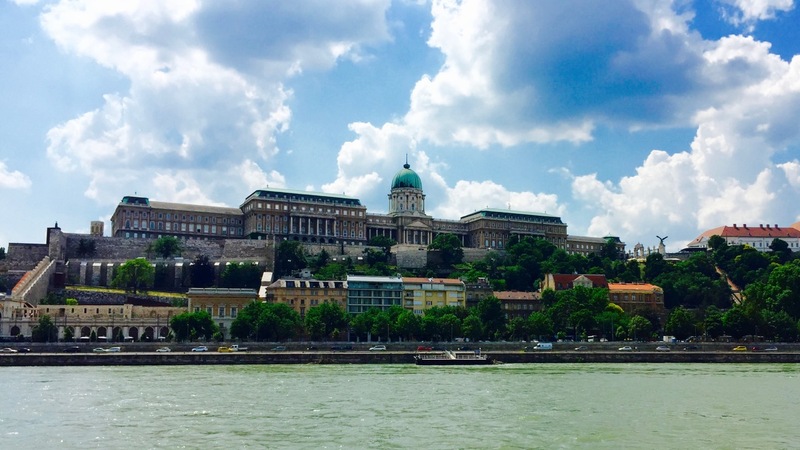 Departing from the southern end of the city, the first sight you’ll see is Buda Castle. 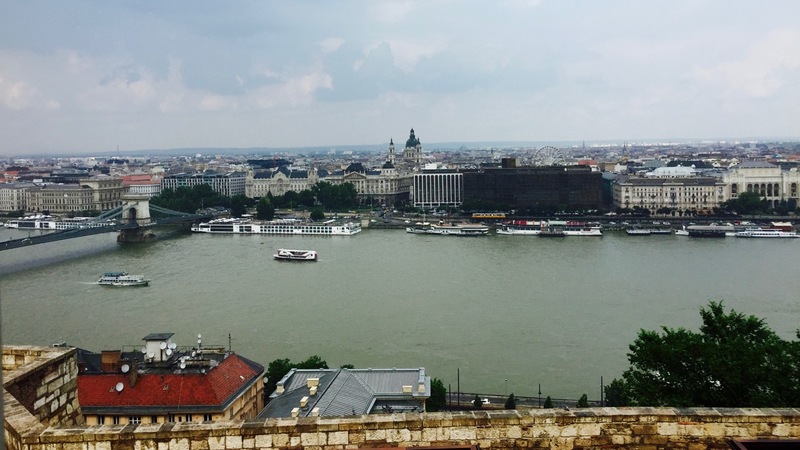 Similarly to the Royal Castle in Warsaw, Buda castle was reconstructed after the war, and is worth a look around if you have a penchant for history, as during the rebuild process, formerly lost medieval ruins were uncovered, which are now viewable by the public. The next major sight is the Chain Bridge. The story goes that the bridge was built because count István Széchenyi missed his father’s funeral in Pest, because the ferry from Buda was delayed due to bad weather, leading to it’s construction in the 1840s. Katy Perry fans will recognise the bridge from the start of her Firework video. 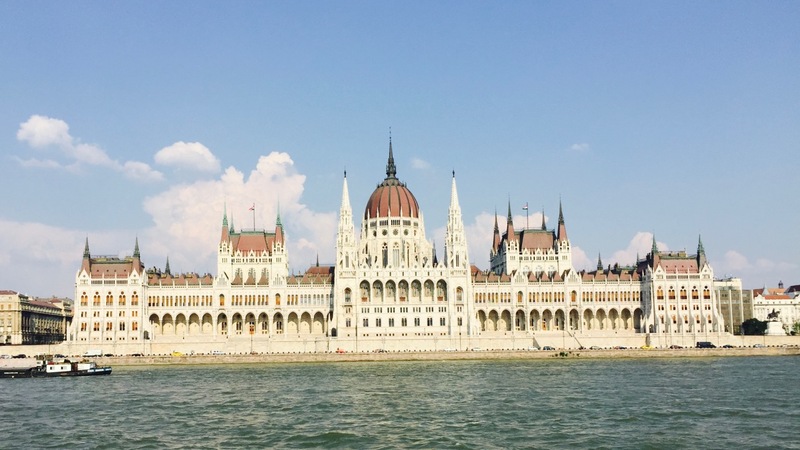 Next, you’ll find the Hungarian Parliament Building, on the Pest side of the river. An international competition was held in the 1870s to design the building – three designs were entered, the judges liked them so much, they had all the designs built (Historic records don’t say whether they were spoilt brats with rich parents) – the other two designs are now the Ethnographic Museum and the Hungarian Ministry of Agriculture, which you’ll find round the back. Margaret island is a 2.5 km long island in the middle of the Danube, right in the heart of the city. Here, you’ll find landscaped gardens, swimming pools, another thermal bath, open air cinemas, and even a hand full of bars and clubs. The island is a great place to relax, especially in the large parks or by the big fountains towards the southern side of the island, which is where the ferry will drop you off – though you can also get there by tram via the bridges at each end. The gardens on the island are an ideal place to sit and chill, plus there’s countless street food stands, particularly on the south side of the island, where you can get a range of drinks and snacks. If you fancy exploring but don’t want to walk, then it’s possible to hire a bike, roller blades, or even a pedal car on the island (think of the Chuckle Brothers’ Chucklemobile and you’re not far off). If you’re in a really lazy mood, you can even get on small a road train for around 1000 Forints, taking you the full length of the island. Not only will you come across some of the island’s main attractions like it’s 100 year old octagonal water tower, you’ll also discover the hidden ruins of the church where Princess Margaret was buried, who the island was named after. Szimpla Kert the first and one of the coolest of Budapest’s ruin bars, and a great place to hang out in the summer thanks to it’s spacious courtyard. 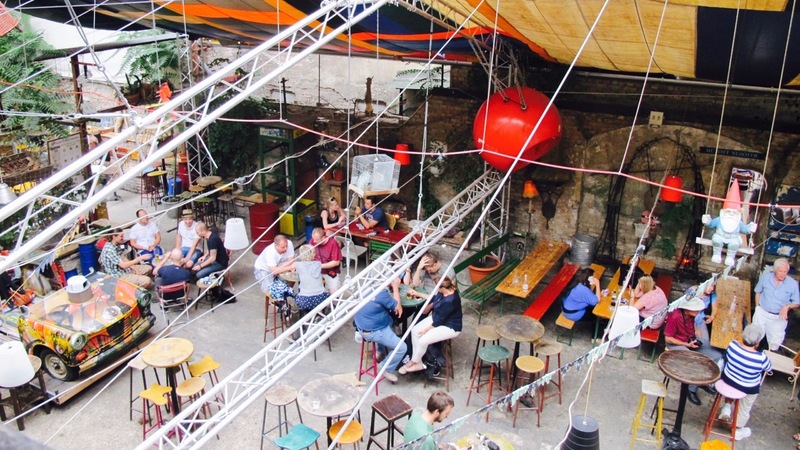 Of 2,330 Trip Advisor reviews, Szimpla Kert has achieved an astonishing 1744 excellent ratings! In fact, the godfather of Budapest’s ruin pubs was voted third best in the world! Probably the only place in the world when you can smoke a pipe sitting in a bathtub and watching movies with kittens and robot vacuum cleaners. 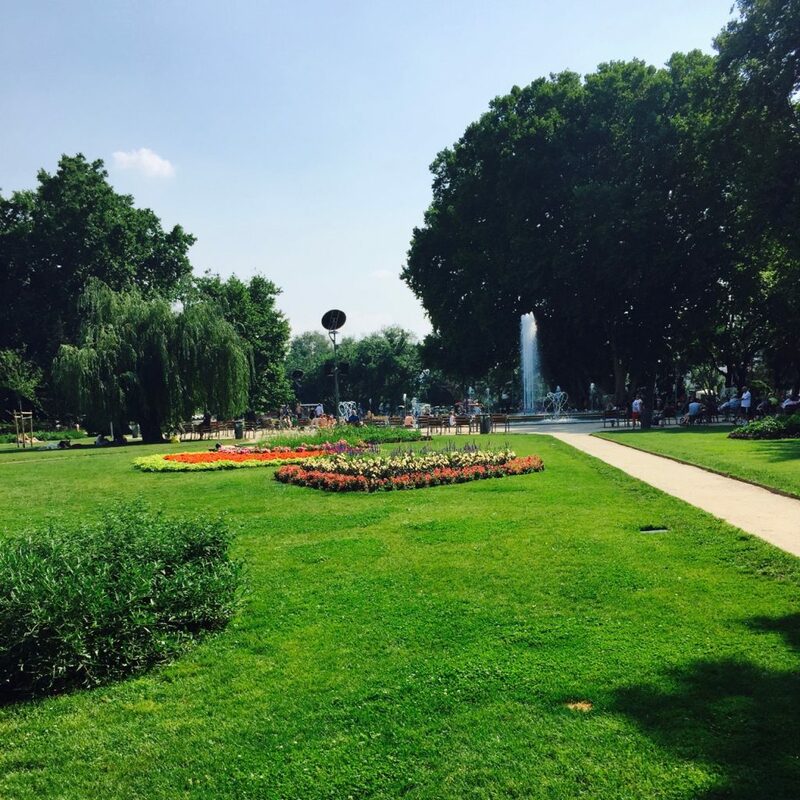 What’s your favourite place to chillax in Budapest? Let me know your travel tips in the comments below!